We’ve all been to those events where you know the organization hosting it had the one employee with an extra hour in their day design and print the event flyers, tickets and/or program. They did the best they could, and it worked for the moment. Maybe it saved them a few dollars in the end, too. Here’s the thing…your event materials could play a role in attracting people to your event. In fact, they often do when they are carefully designed and printed. It can be difficult to get people interested in your event. There is only so much your staff and/or volunteers can do to get people excited. When event materials are designed to standout and the printing is high-quality, it gives you a head-start. This is what you get with Bellia Print and Design. What materials are we talking about? What kind of events are we thinking of? Plus, we can take it a step further for your organization and handle the mailing of any direct mail pieces you are doing for your event. Events come with many moving pieces that need to be managed. 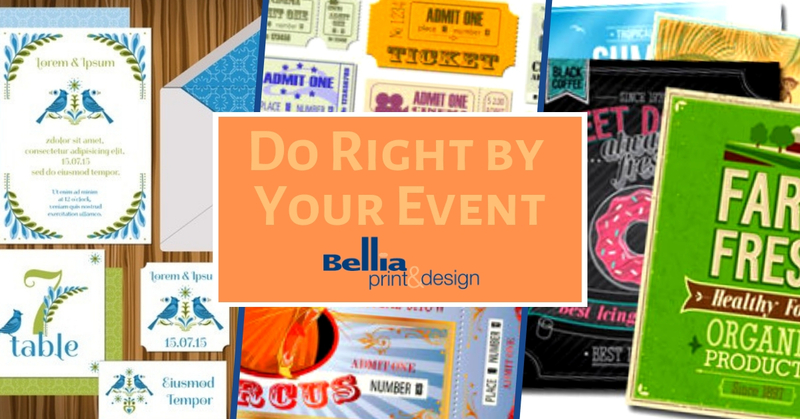 Let a professional print and design company take care of your printing, designing and direct mailing so you can focus on event details.